Unsafe barriers, rusty cages, jagged edges in cages, unsupervised contact between a lemur and an infant who had been left unattended in a stroller, and dilapidated perimeter fencing. Tanganyika Wildlife Park is a ZAA (Zoological Association of America) facility run by Jim and / or Matt Fouts; probably because they started ZAA in its latest iteration, along with Lex Salisbury, who had lost his AZA accreditation while running Tampa’s Lowry Park Zoo. Creating an “accrediting” body, with a confusingly similar name, just undermines real accreditation standards. It’s believed they were a driving factor in getting their state to pass a bill that allows cub handling, quoting: “The park is all about interaction but we always do it in a safe manner and this bill is going to allow us to use those cubs to create an awesome experience for the public, so that they can further connect with those animals,” said Matt Fouts, assistant director for Tanganyika Wildlife Park in Goddard. 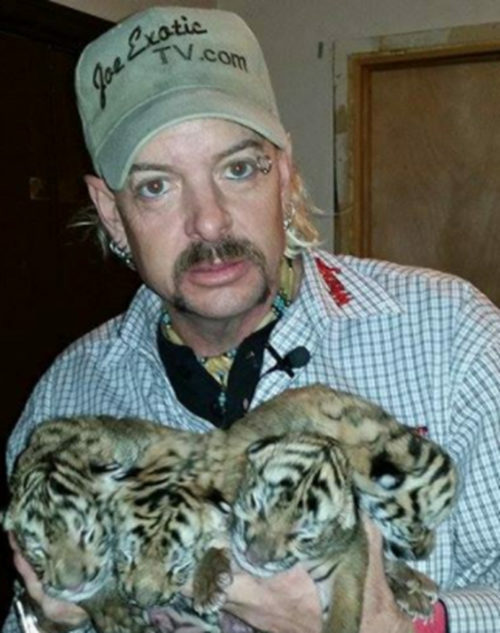 It looks like legitimate AZA zoos have found a willing buyer at Tanganyika Wildlife Park for rare cats. HSUS: A Plan for Our Future? Their commercials have a way of tugging at our heartstrings, but the majority of the general public doesn’t know the real agenda of the Humane Society of the United States (HSUS). This organization is actively trying to shut down zoos – like Tanganyika – across the country. Tanganyika’s Director, Jim Fouts, is aiding the fight against anti-zoo legislation in several states. In a recent article, Laurella Desborough detailed the agenda of HSUS, and some of it might surprise you. If you care about animal welfare as much as we do, please consider donating to your local Humane Society – these local organizations receive little (or no) funding from HSUS and they do the real work of caring for homeless pets. Visit the Kansas Humane Society’s website to learn more about how you can help pets in our area. Or check out our Adopt and Animal page here for ways you can help the animals at Tanganyika and wildlife around the world. WE ARE THE 2% and WE ARE GOING TO WIN!!! 1. Abolish by law all animal research. 2. Outlaw the use of animals for cosmetic and product testing, classroom demonstration and in weapons development. 4. Eliminate all animal agriculture. 5. No herbicides, pesticides or other agricultural chemicals. Outlaw predator control. 12. Prohibit the Genetic Manipulation of Species. Make this rule change and we can fulfill our goals. It is better to be dead than suffer as a slave to humans. end quote from Federal Register. federal level, while enjoying non-profit tax status. Placing dedicated active animal rights advocates in critical positions in state and federal agencies is one method the animal rights use to gain their goals. The first agenda item proposing to abolish all animal research is truly outrageous, since the majority of important discoveries for human health have been made using animals. This continues to be the case. Note that about 98 percent of animals used in research are mice and rats. However, animal rights generally portray this research as being conducted on dogs, cats, and primates. In any case, without ongoing research using animals, many new positive discoveries to improve human health would not be possible. Outlawing the use of animals in product testing is also a problem. The use of animals is the first step in testing for many types of products, whether it is for prescription drugs, chemicals used in homes and farms, or for classroom demonstrations. I well remember working with dead cats in zoology classes. Feral cats are being euthanized because they are invasive species. Using them in the classroom provides real life examples that cannot be adequately done by computer modeling, since actual bodies do vary in many ways from a model. Making vegetarian meals available is fine, unless they are the ONLY choices that diners have. But item four indicates that is the point, since the proposal is to eliminate ALL animal agriculture. That means no meat,no milk, no cheese, no eggs, and on and on. It would also mean the complete extinction of all domestic farm animals since they would have no use and thus would not be maintained. Lest we forget, farm animals do provide another service that is not mentioned by the animal rights people. Farm animals provide a huge amount of fertilizer for the fields where grains and other plant foods are grown!!! So, no more fertilizer either. Scientists at the Department of Physiology, Anatomy and Genetics, University of Oxford, have discovered that going veggie could be bad for your brain – with those on a meat-free diet six times more likely to suffer brain shrinkage. The study involved tests and brain scans on community-dwelling volunteers aged 61 to 87 years without cognitive impairment at enrollment, over a period of five years. When the volunteers were retested five years later the medics found those with the lowest levels of vitamin B12 were also the most likely to have brain shrinkage.It confirms earlier research showing a link between brain atrophy and low levels of B12. Vegans were the most likely to be deficient because the best sources of the vitamin are meat, particularly liver, milk and fish. The elimination of all herbicides and pesticides could have a devastating effect on the human race. Think of eliminating the chemical Deet from use to manage mosquitoes when we are having new cases of dengue, malaria, West Nile virus and other diseases spread by mosquitoes. Outlawing predator control would also mean that when there is a huge over population of bears and cougars and wolves and coyotes, that there would be no means of addressing that problem! And here is one proposal that is already happening…and bound to have some very negative consequences; the proposal is to transfer enforcement of animal welfare legislation away from the Department of Agriculture! The Department of Agriculture is the agency with the expertise in dealing with animals. This move would make it easier for the animal rights ideologues to influence the handling of animal issues. Eliminating fur ranching and the use of furs perhaps would not affect millions of individuals, but it would affect some and it is an assault on the freedom of choice of individuals who may want to use fur in some manner or other. Prohibiting hunting, trapping and fishing would have widespread consequences for our food supply and for elimination of animals that are over populating their environment. While not everyone in the US is hunting animals for food, some people do hunt animals for food. Then there is fish. Most everyone in the US does eat fish either routinely or on occasion, since fish provides many important nutrients to our diet. Eliminating the use of fish for food would have a serious effect on the health and welfare of the population. Ending the international trade in wildlife goods for those in the US would not make much difference as most do not participate in the trade. However, for those of us who may want to import birds or animals, that would no longer be possible. No more imported softbills, pheasants, or wildlife for zoo exhibits, or even for conservation breeding and research. Now here is a proposal that would hit home with almost every US citizen; stop all breeding of companion animals. You got that. ALL COMPANION ANIMALS! And they make a point of including purebred dogs and cats, which of course would include service animals, hunting hounds, search and rescue animals, and of course, all of our canaries, budgies and parrots. This is the point we need to make with all our family members, all our friends and neighbors. We need to keep pointing out that the HSUS and their ilk are trying to take away ALL our pets! Of course, we might expect the animal rights folks would want to end the use of animals in entertainment and sports. In this case they are of course including zoos and marine world and any activities involving animals, such as horse racing, rodeos, or hunting with dogs. We can see they are working on that right now, with the promotion of the film Blackfish which casts SeaWorld as the bad guys for using orcas in their shows. They call this abuse. The facts don’t matter and the film has been documented as being full of misinformation and outright deception. Lastly the animal rights cult followers want to eliminate all genetic manipulation of species. Consider that the reason we have the many types of poultry, pigeons, horses, cows, sheep, pigs, goats, dogs, and cats, is due to breeding for specific traits, which is genetic manipulation. That should tell us a lot about these radicals. They have a belief system that is so powerful they cannot consider ANY animal use as being good for the animals or for the human race. Now, that is their belief and they want to IMPOSE that belief on the rest of us in the USA. Consider again, they are only TWO PERCENT of the population and they want their ideas to control the other 98 percent, which is you and me and the many individuals we know who love our birds and animals, who enjoy meat and fish for food, who enjoy the zoo and like the idea of conservation of wildlife. The animal rights cultists don’t even want to conserve wildlife! They actually don’t seem to like animals. They just want to USE animals as their means of controlling the rest of us. Because these animal rights radicals are making some headway in the US with their agenda, last year getting hundreds of laws passed in many states, it is extremely important that everyone who reads this article makes a point of educating family members, neighbors, friends, and the media when the opportunity appears. We need to educate everyone about this extremely dangerous agenda which would forever change our society, and not for the better. Not only would we lose our birds and animals, but even our health would be at risk due to the change of diet, the lack of new medical research and adequate testing of prescription drugs. This is a very very serious matter on which we all need to take action at every opportunity before we lose more freedoms regarding animals. The rant above, against animal welfare organizations, shows the true intent of those behind Tanganyika Wildlife Park and the ZAA. Note the USDA rarely actually counts animals. They base this on the honor system of the person they are inspecting. This feel good video makes people think that taking animals from the wild and sending them to cages in Kansas is helping conservation. White lions are only produced through excessive inbreeding, so anyone who knows anything about conservation knows you would never breed white lions for any sort of conservation program. 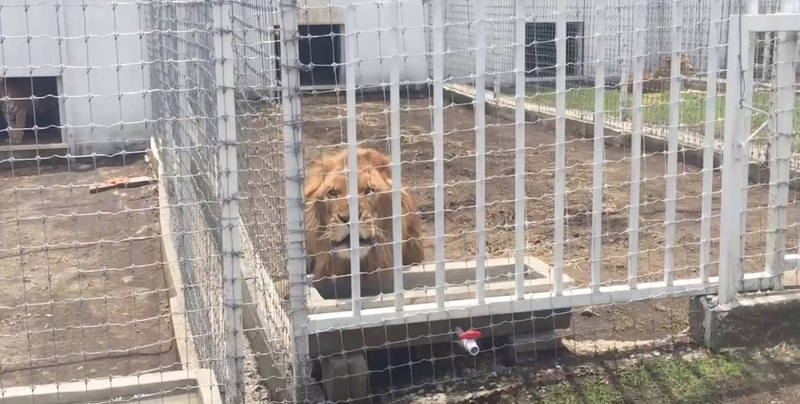 It seems the crew at IAG/British Airway have no idea that they are assisting in the proliferation of big cats in cages in America by dealing with a known animal trader like Mike Bester in the video. Can anyone tell me if the cubs in the video above came from the facility below?